The Draft Southwick Parish Council February 2019 minutes have been published. The April 2019 edition of Southwick Village News is now available on the Newsletter webpage. How to report problems to Wiltshire Council ? Visit this link to report problems online to Wiltshire Council, or download the App ! Having difficulty finding what you are looking for? HAVE YOUR SAY ON NEIGHBOURHOOD PLANNING. On behalf of the community, Southwick Parish Council has, over the past two years, been working on what and how Southwick might look in the near future. In this respect, consideration has been given to topics such as housing needs, traffic congestion (especially HGVs) and business & employment opportunities. The Neighbourhood Plan Steering Group would like to hear from stakeholders in the village, including residents, social organisations & clubs, church groups, schools, shops, businesses, etc. The Neighbourhood Plan will reflect your hopes and needs for Southwick. This can only work if residents understand the changes that may happen, so we have arranged open days on Friday & Saturday 24th & 25th May 2019 commencing at 10am in the Village Hall. This is your opportunity to meet the Steering Group Members, to see what work has been done to date and to express your views and opinions. Maybe with your expertise / experience you could join the Group. Chair - Southwick Parish Council. Well here we are again into March already and speeding towards Easter. Where does the time go? Everything has recently been taken over by Brexit, or blamed on Brexit. I am pleased to say that the problem horse mentioned in Feb issue on Goose St has sorted its self out and the horse has gone and a new gate fitted to the field. Crime wise we read nearly every day that someone, somewhere has been stabbed, beaten up, robbed or killed by a dangerous driver. I know I am now getting older and tend to reminisce on the past but what has happened to modern society? The world is supposed to be improving with better living conditions and modern technology. Successive governments over the past years have enforced cuts to public spending on the NHS. Although still a wonderful service it is being pressurized from all sides and the Police force is becoming ineffective with manpower shortages which the criminals in the community will not hesitate to exploit. I am still trying to keep this organization going in the village but I am afraid the Police liaison side of it is now basically non-existent. The major worry with the police at the moment and headline grabbing news are the young people who take to carrying weapons to so called, “protect themselves” as they are constantly being bombarded with gratuitous violence from the TV and video games it is no wonder that they accept the use of violence so readily. There are very few youth clubs they can attend due to lack of volunteers, finance and H&S regulations, and these days perhaps not even interested in leaving their X box’s to attend. In Southwick if there was a suitable club I think most youngsters would benefit from learning something useful and interesting. For instance, basic every day car maintenance, changing a tyre or light bulb. Even self defense/unarmed combat. Something has to be done collectively as a community to stop young people being bored and retreating into their own worlds of gaming. Ultimately it comes down to parents to engage in providing and joining community events and encourage children to become involved in community activities and to always know what your child is doing and where they are at any given time. Roaming the streets in gangs, bored and causing trouble is an avoidable option which ties up a lot of valuable police time and resources which could be utilized on other more serious crime prevention. In the same context, youngsters getting drunk and sustaining minor injuries necessitating a medical response also use valuable resources. Would they still abuse the system if they were billed each time for the call out? I am not saying that this village has a problem at the moment as we remain reasonably crime free but that is surprising considering what regularly occurs a few miles away in the centre of Trowbridge and we must therefore all remain vigilant as to what goes on in our local area. The Police remain stretched and therefore rely more than ever on local information and intelligence passed to them. Don’t feel guilty that you are telling tales, I am sure you would feel a lot worse if you did nothing and a young person in your neighborhood was stabbed to death and you had to live with that guilt. It seems to me that knife crime and drugs appear to be linked with more dealers spreading out into rural areas. Again this can only be thwarted by passing information on. 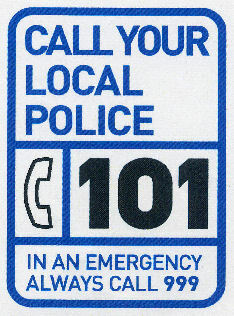 Never forget this can be done anonymously via Crime Stoppers on 0800 555111. Welcome to the New Year and 2019. I hope that you all had a lovely festive period and crime free. My Christmas was busy and slightly complicated by all my grandchildren, in turn, having colds and tummy upsets. As I write this I am unaware of anything major happening within the village. There have been a lot of burglaries in Trowbridge, mostly minor with small items being taken, also there has been a lot of incidents of criminal damage to vehicles, with tyres being slashed and vehicles being scratched. In Bradford on Avon there has been a spate of vehicles having their number plates removed, it is unclear if this is just malicious or that the plates are being reused for other crimes. I am aware that there have been a few traffic incidents in and around the area, hopefully no major injuries. There has also been an ongoing incident of a horse being grazed and kept on a piece of land without the owner’s consent. The Police and local authorities are aware and monitoring the situation. As I write this the horse is still there and I suspect that there is not much that anyone can do about it as the original gate was not secure thus giving access to the field in the first place. Now that the village school is back, I note that the same ongoing traffic problems are also back. Corner cutting at the bottom of Blind Lane, poor parking on pickup and drop off times in Hollis Way, speeding by parents who are running late for drop off and pickup. To my co-ordinators I have not yet arranged any dates for this year’s meetings. I will liaise with Melissa the PCSO and see what we can come up with. Please note that material is posted to this website within hours if not minutes of it being received. Welcome to the official Southwick Parish Council community website. Southwick is a village two miles south west of Trowbridge in Wiltshire. The primary purpose of our website is to provide Parish Council information. Its secondary function is to provide a community website on which organisations and individuals can share news and advertise events. Village organisations and individuals may post items of interest to villagers on either the Noticeboard or the News/Articles column.News items that include photos will be posted in the middle column. Items sent to the Editor are usually posted within a few hours Initially please contact the website Editor using the Contact Button Subsequently you will be able to email your electronic contributions, as an attachment, direct to the Editor. If your organisation, under the Community Button, would like a link to its own website or to its own page on our website please contact the Chair of the Parish Council using the Contact Button. The cost to the Parish Council for the design and setting up this website was £346. In addition to this there is small annual contingent management fee.